Freshwater availability for drinking is being disrupted around Earth. Same for irrigation water relied upon to grow many crops. 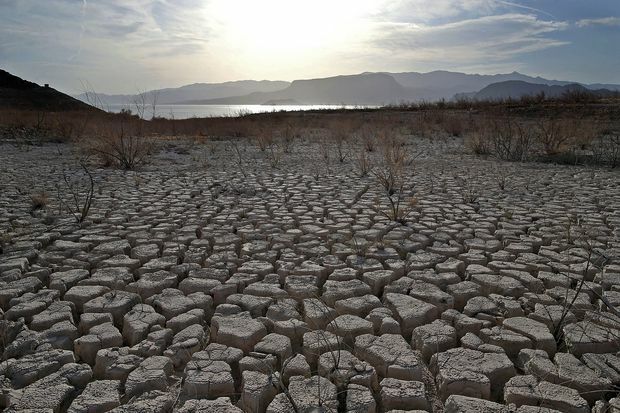 Soils are drying out and groundwater is being depleted much faster than it can be recharged. Alpine glacier water storage in snow and ice is collapsing, and extreme droughts in some places and torrential rains with floods in other places is accelerating , . 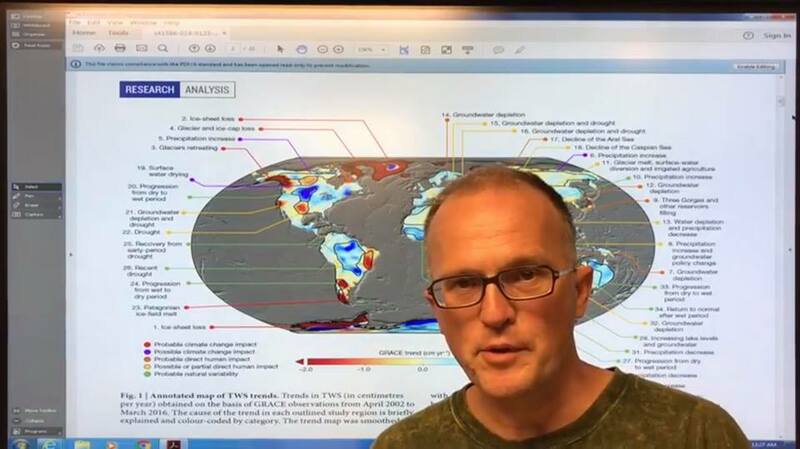 I discuss Terrestrial Water Storage (TWS) measurements from GRACE satellites, and changes around Earth from 2002 to 2016, while the satellites ran. ‘This is an eye-opener’: Changes in global water supply hint at future conflicts and crises“: ‘By combining 14 years’ worth of satellite data, scientists have captured a startling portrait of the world’s water supply undergoing rapid transformation. The new analysis points to areas where there is increasing potential for conflict as a growing demand for water collides with the impacts of climate change. In Canada, the maps shows shifting water supplies that include wetter, more flood-prone regions in many areas of the country but a general drying out in the western sub-Arctic.’ Article continues at link. 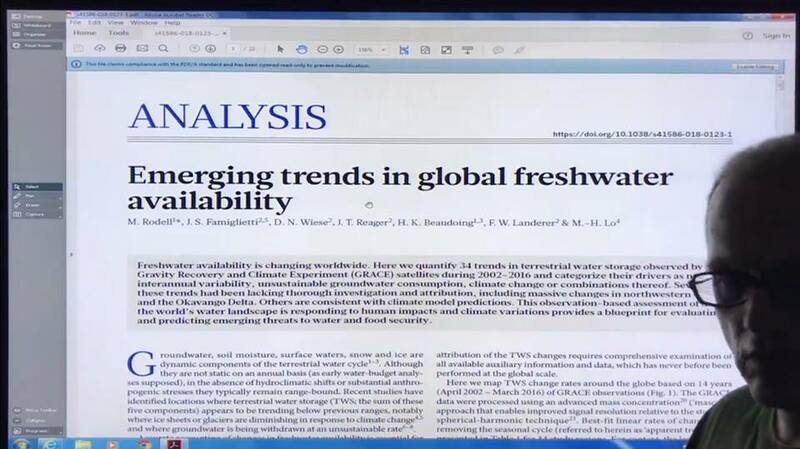 Abstract: ‘Freshwater availability is changing worldwide. 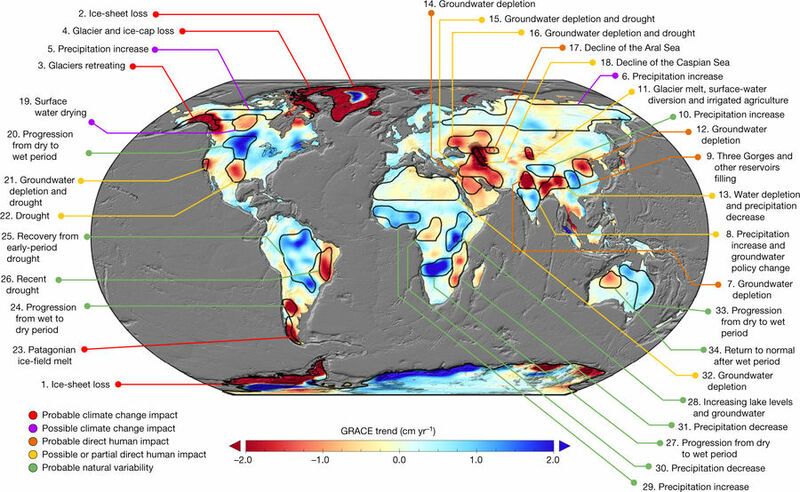 Here we quantify 34 trends in terrestrial water storage observed by the Gravity Recovery and Climate Experiment (GRACE) satellites during 2002–2016 and categorize their drivers as natural interannual variability, unsustainable groundwater consumption, climate change or combinations thereof. ‘Several of these trends had been lacking thorough investigation and attribution, including massive changes in northwestern China and the Okavango Delta. Others are consistent with climate model predictions. This observation-based assessment of how the world’s water landscape is responding to human impacts and climate variations provides a blueprint for evaluating and predicting emerging threats to water and food security’. Continues at link, above. This entry was posted in Catastrophe, Climate, Climate Change, Global Warming, New Video, Rapid Climate Change, Science, Uncategorized, Videos, Warnings, Weather and tagged Aerosols, Altitude, AMOC, Arctic, Arctic Amplification, Arctic Sea Ice, Atmospheric Rivers, Carbon Dioxide, CDR, Climate Casino, Climate Change, Climate Mayhem, Cloud Condensation Nuclei, Clouds, CO2, Coastlines, Contrails, Convection, Erosion, Feedbacks, Ferrel Cell, Fractured, Geoengineering, Geoengineering Watch, Geography, Geology, Geomorphology, GHG, Global Warming, GRACE, Grand Solar Minimum, Greenland, groundwater, GSM, Hadley Cell, Hydrological Cycle, Hydrology, ice, Jet Streaks, Jet Streams, Latent Heat, Negative Vorticity, Ocean Currents, Paul Beckwith, Polar Cell, Polar Vortex, Positive Vorticity, Precipitation, Pressure, Radiative Forcing, rain, rainfall, Salinity, Sensible Heat, Siberia, Siberian, Siberian Atmospheric Rivers, snow, Solar, Solar Cycle, SRM, SSW, Storms, Stratosphere, Streaks, Sudden Stratospheric Warming, Sun, Sunspots, Superstorms, Temperature, THC, Thermohaline circulation, Tropopause, Troposphere, Water, Water Cycle, Water Vapour, Weather, Weather Extremes, Weather Weirding, Weather Whiplashing, Weather Wilding, z limate. Bookmark the permalink. Are ya sure the changes are not mostly caused by geoengineering?? Heard you and dane go round and round. Still u dont believe in the MASSIVE GEOENGINEERING event right over your head. I guess you dont get out much in the real natural world that you claim to want to save with your blindfold off, and head out of your but. But ill come back once in a while to see when you bend the knee. Under a majore path of the sprayers working the moisture river coming off the great lake of supieror. 40+ planes during the day- none at night. No comercial air trafic routes.